If you have missing teeth, you can tell that more than your smile has been affected. Your confidence plummets, your diet changes to unhealthy, processed foods, and you start to even look older as your jaw bone deteriorates. Replacing them wouldn’t just be for a better smile, but it’ll help improve your mindset and whole wellbeing. That’s why your dentist encourages people with missing teeth to explore dental implants in Fort Worth. Dental implants offer the most stable, long-lasting replacement solution because of their intricate placement and innovative design. Read on to learn the 6 most important things about getting dental implants. Dental Implant Placement is Simpler Than You Think! Dental implants actually require a minor surgical procedure, but the process is still quite straightforward. You shouldn’t avoid this procedure because of surgery—it could provide the most permanent tooth replacement solution on the market! 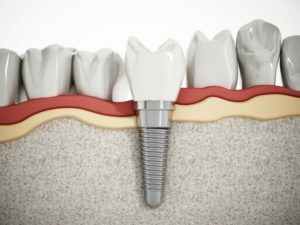 Dental implants require oral surgery only because the implant posts must be inserted within the jaw to create the most stable tooth replacement. The whole process is relatively simple, painless with the help of anesthetics, and you even get a helpful pain medication to assist in the healing period. To begin, your dentist in Fort Worth will administer a local anesthetic to the affected area, numbing it for the procedure. Then, the dentist makes a small incision in the gum tissue, revealing your jawbone. This incision is meticulously planned so that it’s just the right size and placement to insert your implant post. Afterward, you’ll have to take 3 to 6 months to heal before returning to our office. Right after your placement, your dentist will give you specific instructions on how to care for your smile for the next few months. It’s critical to follow these instructions as the healing period is essential to allowing the bone to fuse with your new implant. After you’ve healed at home, you’ll return to our office to have your dental prosthetic attached to your implant post. This is the best part of the whole process! It’s when you can actually see that your tooth has been replaced with a natural-looking and feeling restoration. It all starts with a consultation. It’s important to meet with your implant dentist in Fort Worth to plan your dental implant placement, goals, and the process. Dental implant placement is a process. But your dentist is here for you every step of the way! Osseointegration is critical to the success of your dental implant placement. This is the process of your implant fusing with the bone to create stability. Abutments are the bridge between implant posts and your gorgeous dental prosthetic. When you visit your dentist after healing, your dentist will attach an abutment, which holds your dental prosthetic in place to your implant. Every implant is custom made! Every step of the way is personalized to you and your needs. You will need to visit your dentist periodically. Dental implants act as a natural looking and feeling replacement for missing teeth. Getting checkups and cleanings are key to their longevity! Are you ready to explore dental implants in depth? Contact your local dentist! Here at West 7th Smiles, we know that it’s key to have every component of your smile for overall health. That’s why we offer implant placement and restoration for patients who want to recover their oral health. Learn more about how we can help you by visiting our office today!